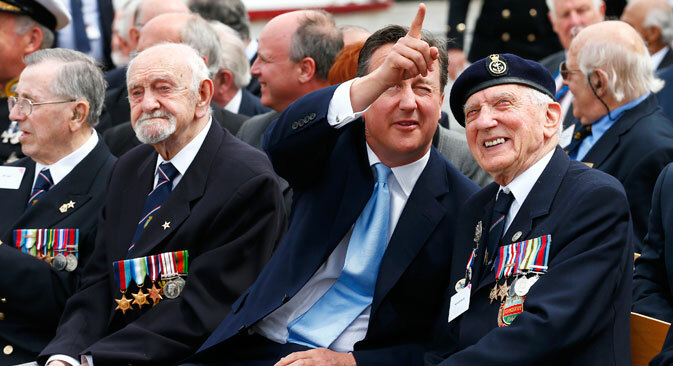 D-Day veterans were the guests of honour on board HMS Belfast on Thursday, June, 5, at a ceremony marking the 70th anniversary of the departure of the greatest invasion fleet in history. Second World War veterans were the guests of honour on board HMS Belfast yesterday at a ceremony to mark the 70th anniversary of the departure of the greatest invasion fleet in history ahead of the D-Day landing in Normandy. At the lunch which followed the midday firing of a six-round salvo from the main barrage of the HMS Belfast, event organiser Tim Lewin revealed that Belfast had been earmarked to carry both Winston Churchill and King George VI on D-Day itself and take them into action. Churchill decided it was too great a risk for the king to be so close to danger, only to be told by the monarch, “If it’s too dangerous for a king, then it’s too dangerous for a Prime Minister,” and neither travelled. As recompense for not carrying such celebrated crew members, the ship was given the privilege of firing the opening salvo on D-Day, although as events transpired, it was possibly pipped to the post on this. In an event well-supported by a number of Russian businesses, a friendly spirit of Anglo-Russian accord prevailed, with many references throughout the day to the part played by the Red Army in the successful outcome of D-Day. Great Britain’s former First Sea Lord, Baron West of Spithead was unequivocal in his assessment of Russia’s contribution. “One has to remember that the Soviets ripped the guts out of the German Army,” he argued. “But what’s nice now is that the Russians recognise that the supplies we sent to them in the Arctic Convoys were absolutely crucial, too, particularly for keeping Leningrad alive. The same sentiments were echoed by Terry Charman, senior historian at the Imperial War Museum. Although the casualties were far fewer than feared, those aboard HMS Belfast, which, because of its size, acted as a makeshift hospital ship, saw the horror of D-Day first hand. One such was Ted Cordery, 91, who vividly remembers the injured who were brought off the beaches. Prior to D-Day, as part of HMS Belfast’s torpedo crew, Mr Cordery had been heavily involved in the operation to sink the German battleship Scharnhorst and on D-Day itself he saw his colleagues fire repeatedly on German positions in aid of Canadian and British forces going ashore. The firing of the ship’s six-inch guns on the Thames gave just a hint of what the Belfast’s broadsides must have sounded like on that fateful day 70 years ago, and the rendition of the Last Post by bugler Kevin Alderton of the Honourable Artillery Company in memory of the fallen provided a perfect backdrop to a day of both poignant memories and heartening solidarity.